The Cleveland Orchestra once again rolled into town this week for their all-too-brief Miami season. 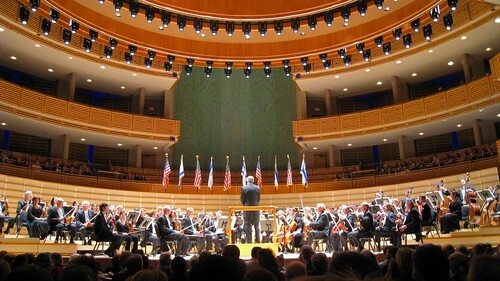 They performed a concert last night in honor of Israel’s 60th anniversary, and perform a second program this Friday and Saturday. Last night’s program, a nod to Leonard Bernstein’s historic performances in Israel in 1948, included Beethoven’s 5th Symphony, a Mozart Piano Concerto, and Prokofiev’s Overture on Hebrew Themes. The show opened with readings of the US and Israeli national anthems, which musically work very well together, the latter’s sombre slow build a nice counterpoint to the Banner’s usual pomposity. This was followed by a rather lengthy curtain talk by the executive director of the Greater Miami Jewish Federation (at one point, he launched into a list of technologies invented in Israel!). Originally composed for clarinet, string quartet, and piano, Prokofiev transcribed Overture on Hebrew Themes for orchestra himself, and it does as advertised, running medley-like through Klezmer and other recognizable ideas, toe-tapping one moment, morose and swooping the next. So, how do you get a piano to the front of the stage in the middle of an orchestra performance? Like this, my friends — you break down as many of the band risers as you need to wheel that puppy out. I’m not sure they needed to bother, actually. Mozart always sounds like Mozart, but the Piano Concerto No. 21 is almost a self-parody, the most Mozarty construct ever, a summation of every fun idea out precocious Austrian buddy ever had. Well played by the 31-year old Shai Wosner, who’s nervous tics complemented the music pretty well. He fidgeted with the height-adjust on his piano stool, made motions as though wiping dust off the keyboard and shaking it onto the floor, and shook his head quickly during the more stirring piano-less passages. A couple of times I caught him sort of shaking his fist at the keyboard before launching into one of his slow phrases. He seemed to take less relish in delivering these than the 32nd note runs and trills, which he handled with commanding smoothness. Don’t let me mislead you, though — Mozart is always a delight to hear, and this was a big, delicious slice of Mozart (who, first and foremost a keyboardist himself, is arguably better represented by this concerto than by, say, one of his symphonies or operas). But it was all preamble, because after intermission came LvB’s Symphony No. 5, one of the most gripping pieces in western music. It’s on pieces like this, that you’ve heard 100 times before, that you truly begin to appreciate the unparalleled mastery of the Cleveland Orchestra and the rich sound of the Arscht’s concert hall. Sounds and details I’d never noticed before snuck out at every turn, and the whole thing was alive in a way which few things are. Opening with the heavy, stark, almost modernist first movement, the symphony has light moments, but they are few. Mostly it’s dramatic and full-throttle, and fainting and heart attacks do not seem like inappropriate responses. A friend once explained to me that while the string quartet is his favorite sound in terms of timbre and nuance, the appeal of an orchestra is its sheer visceral power, and that power was in full force last night. Well, you missed it. No worries — you can catch the Cleveland Orchestra this weekend, in a program built around a Tchaikovsky violin concerto. Tickets available for Friday and Saturday, tho only Saturday has some of the cheaper seats left. i missed it, and i’m broke…yay WMC! I was there, and I agree. Beethoven’s 5th really made it very apparent to me why the Cleveland Orchestra is considered one of the world’s best. It is shame the residency is so short.